Getting help in Shingle Springs because drug or alcohol addiction can destroy you physically and mentally. However, both these conditions are treatable. But treatment is not just about healing your body. It’s also about unbundling the reasons behind your addiction and learning skills to stop you from becoming dependent again. You get to repair relationships fractured by your addiction and you are empowered to become productive again. There are so many resources available in Sacramento! If you live in Shingle Springs, and have fallen victim to these substances don’t hesitate to seek treatment. There are enormous resources at your disposal. 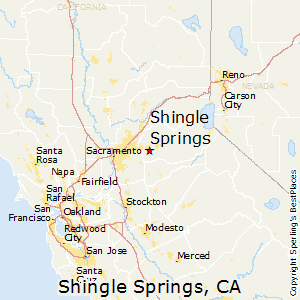 Shingle Springs is a fairly small community of around 4,432 people, in California’s El Dorado County. The good news is that according to a 2015 report by the Population Institute for Wisconsin University, El Dorado is the seventh healthiest of California’s 57 counties. However, El Dorado’s substance abuse records appear to put a damper on this achievement. The same report revealed that while binge drinking was at 17 percent for the state of California, the figure was higher for El Dorado at 21 percent. According to addiction experts, a binge drinker is a woman who has more than a single drink a day or a man who has more than two. The report also revealed that DUI fatalities were at 44 percent for El Dorado, which was higher than the state average of 31 percent, and the national average of 14 percent. Although drug-associated deaths are less frequent in California than countrywide, overdoses are still a cause for concern. Statistics of the California Opioid Overdose Surveillance Dashboard revealed that between 2008 and 2016, there were around 17,000 drug overdose deaths in California with 85 of these being in El Dorado. This was way lower than Sacramento County which registered 657 deaths but it’s still high enough to cause concern. Drugs abused include marijuana, heroin, prescription drugs, meths, and cocaine. Other worrying conditions such as hypertension are said to be occurring alongside substance abuse. According to El Dorado’s Health Status Assessment for 2014, this hypertension-substance abuse co-occurrence led to nearly 400 hospitalizations for every 10,000 people, and nearly 500 visits to the ER per 10,000 people. Excessive use of drugs such as marijuana has also led to more lung disease admissions to hospitals and ERs. The full legalization of marijuana at the beginning of 2018 could further exacerbate the problem. Already, much of the legal weed produced is ending up outside the state. And with more taxes planned on the weed at the state and county level many may increasingly turn to the black market for cheaper, but unregulated and therefore more toxic forms of marijuana. One report suggests that current substance abuse levels in El Dorado are to do with the fact that most inhabitants have difficulty accessing outpatient or inpatient treatment that meets their needs. They’ve also complained of a lack of aftercare, following hospitalization. To address the opioid problem and concerns around it, the state of California has embarked on ventures to increase access to treatment, prevent overdoses, and generally educate citizens on the perils of substance abuse. In El Dorado, itself, there are combined ventures by local government, law enforcement agencies, schools and treatment givers to expand state ventures to all neighborhoods, Shingle Springs included. To further improve access to therapy, treatment groups and health care givers are working to ensure that those who arrive at hospitals or ERs for drug and alcohol-associated problems, get the necessary referrals. Community leaders are also stepping up community-awareness of Naloxone, an emergency drug that halts drug overdose effects until help arrives. Additionally, California’s Department of Drugs and Alcohol Programs keeps a close supervisory eye on rehab programs to encourage improvements in procedures. Furthermore, state Problem Oriented Policing (POP) groups are on standby to respond anytime to any form of crime. Heavy fines and sentences for drug or DUI offences continue to serve as a deterrent. If your home is in Shingle Springs and you’re a binge drinker or you’ve been taking drugs to the point of oblivion, you don’t have to continue ruining your life this way. Follow the steps below and get your life back on track. Although no treatment centers are located in Shingle Springs itself, there are a number of facilities in and around El Dorado that will deal with your specific needs. Choosing a suitable treatment center. Being assessed to determine the type of treatment that suits you. Detoxing to wash the alcohol or drugs from your body. Attending inpatient or outpatient treatment. Maintaining ongoing support to ensure long-term sobriety. 2. What should I look for in a center? Your treatment will take place at an inpatient or outpatient facility. However, identifying a treatment center that will meet your needs can be a long-drawn out process. But take your time. You need to get it right. Studying the websites of centers in and around El Dorado is a good start. Look at their treatment options and decide whether they would truly strike at the heart of your addiction, and give you the help you need. A structured process is usually the best procedure to opt for. It enables you to monitor your progress alongside the staff. If you haven’t achieved what’s expected at a certain level, you should be able to go back to it and improve on it, or change to something more effective. You should also look out for a dual diagnosis process. The center should treat both your physical and emotional state. Addiction recovery is nothing without some focus on the underlying mental issues tied to your addiction. The best centers are also accredited with suitable addiction supervisory bodies and have certified staff. They also offer ongoing support once your treatment is over. This helps you avoid a relapse. Very importantly, find out what your insurance can and cannot cover, and whether it will allow you to switch from one program to another if you’re not satisfied with the first one. If your insurance won’t go all the way, or won’t accommodate possible change, find out what payment arrangements your chosen facility can allow you over and above your insurance. You need to finish all the stages of treatment to achieve full sobriety. When you’ve decided on your facility, a treatment therapist will take you through a process of tests and form-filling to find out your level of addiction, and type of substance you were using. Often people will have mental problems that are occurring at the same time as their addiction and which make their condition worse. The assessment should uncover them. They will help your treatment counselor to work out a program specific to you. But your treatment will generally center on detox, behavioral therapy and relapse prevention, and will end with aftercare procedures to enable you to remain sober when you’re out in the world again. Detox is the first level of treatment. It cleanses your body of the alcohol or drugs that have been ravaging it. It can last up to two weeks depending on the severity of your condition. Detox takes place at a hospital or other inpatient facility equipped and licensed to carry it out. You can’t do it yourself at home. There are withdrawal symptoms that happen as a result of the drug being withdrawn from your system, and they can be extremely difficult to cope with on your own. You may also experience deadly conditions such as seizures which you will not be equipped to handle by yourself. So you need to have your detox done where you can be closely monitored by medical staff and given medication if things become too hard to bear. It’s a must for anyone who’s abused alcohol and for heavy and long-term drug users. So it’s a requirement for most people unless they’re told their addiction is too mild to merit one. Don’t be tempted to stop treatment after detox. That would be a mistake. The substance has left your body but you haven’t learned the skills needed to identify the mental or psychological triggers of your addiction and handle them in a drug-free way. This is a vital step towards maintaining your sobriety going forward. That’s where rehab comes in. If your detox took place at a hospital, you can’t have your rehab there. You will have to find a suitable inpatient or outpatient facility. Some inpatient facilities that offer detox, allow you to transition smoothly to inpatient or residential rehab. You won’t have to change facilities. Regular outpatient facilities are for those with less serious addictions who may or may not have gone through detox. This option is for you if you have serious addiction. You live within the institution so your recovery can be intense and fully focused. The more dedicated and professional the staff, the easier your recovery will be. Some facilities are upmarket with top-of-the-range facilities including tennis courts, swimming pools and gyms. The intention is to increase your well-being while you recover. What are the basics of inpatient treatment? Behavioral therapy is an important part of treatment. It helps you modify your behavior so you can deal with stressors in your life without resorting to drugs or alcohol. You learn healthy ways to cope with possible triggers such as anger, boredom, and general challenges that happen in life. You’ll go through therapy on your own and in a group with your peers. You could also possibly undergo family therapy. If need be, you’ll be given medication. Qualified staff should watch over you like hawks and adjust your treatment when necessary, for better results. How long is inpatient treatment? Many programs last for a month, others three months, and still others 6 months to a year and beyond. The longer you stay the better. Institutions with a structured approach are a good option. You move from one step to the next only when you are clearly ready. How does it compare to inpatient treatment? This form of treatment is similar to inpatient care. The major difference is that you commute to the treatment center daily. Otherwise you go through behavioral therapy, and through individual, group and family counseling. There may be drug screening to prove that you are sticking to your resolve to stay clean. Meds may also be given. There are different levels of outpatient care, however. Regular care is for those with mild addiction forms who may attend therapy about twice a week. Studies have shown it to be very successful for those involved. More rigorous outpatient treatment can be administered to those who are leaving inpatient care but still wish to polish up their skills. For instance there is the Intensive Outpatient Program or IOP where they attend for several hours per week. Everyone needs ongoing support when they leave a treatment facility. This way they can stop a relapse from happening. This support may take different forms. You can choose to attend support groups, visit a therapist regularly or take up meditation, or do all three at the same time, and more. What is the idea behind a sober living home? After inpatient care you may need a further period of adjustment before returning home, so you can check yourself into a sober living home. It’s run by your peers who’ve been in recovery for a while. The atmosphere is more relaxed and the idea is to give each other gentle support before taking up your lives again. With so many options available in California, there’s no better time to begin your recovery than now. Please call us now for help finding a rehab that fits your needs. There are many local facilities to the Sacramento area as well.